Austin Healey 3000 BJ8. Driven into the shop. This was a old redo by a not so talented home restorer/car flipper. 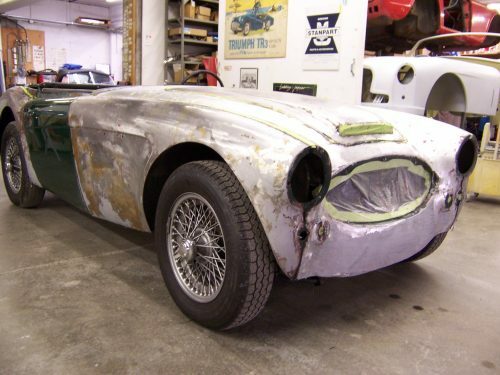 Completed covered in thick sheets of all-metal style body filler that covered several decades of rust, old repairs, sins and shenanigans. 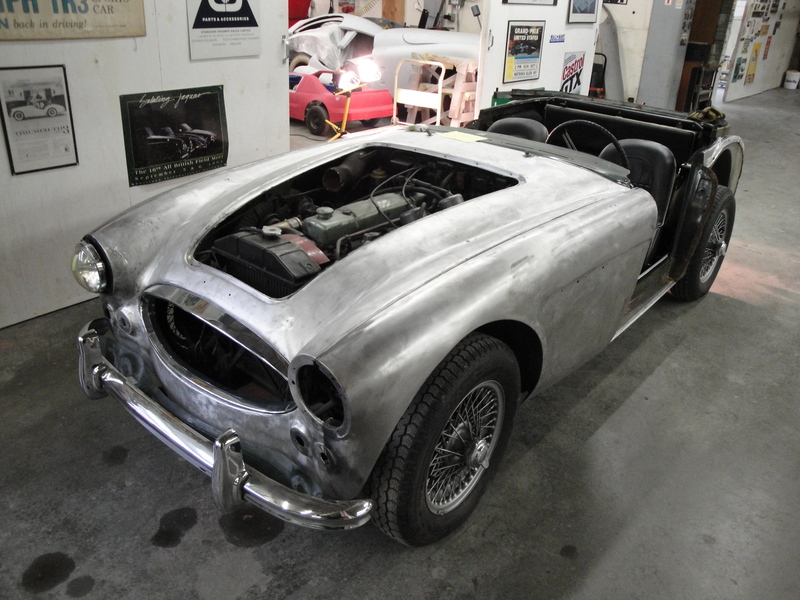 After several days of painstaking chemical stripping, the aluminum/steel work can begin. The gearbox leaks as much oil as my leather seal Moss gearbox in the XK120 OTS. 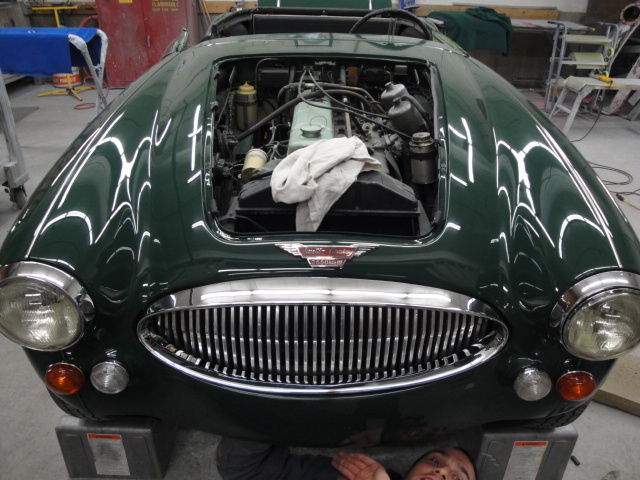 Austin Healey 3000. Old finishes being removed. Austin Healey 3000. Old finishes being removed. 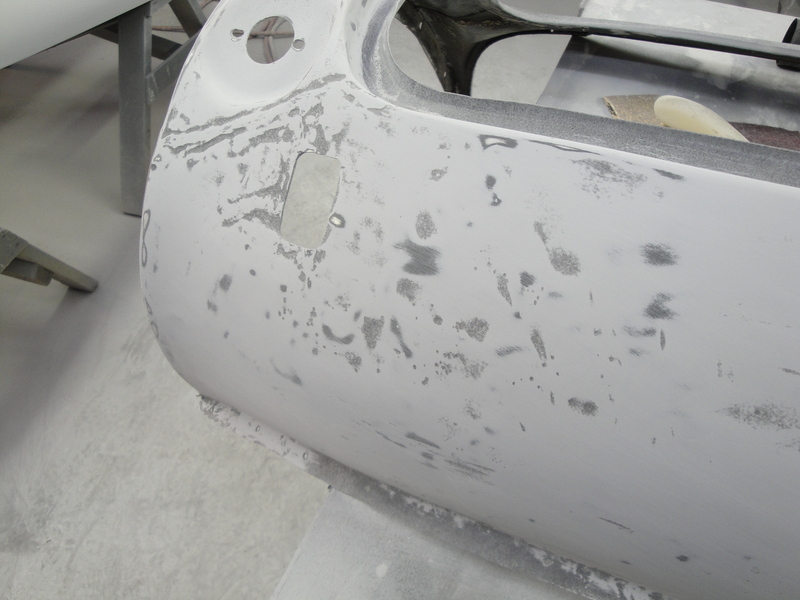 Note how thick the alum filler is on the LR fender. The majority of the body was covered in the same manner. 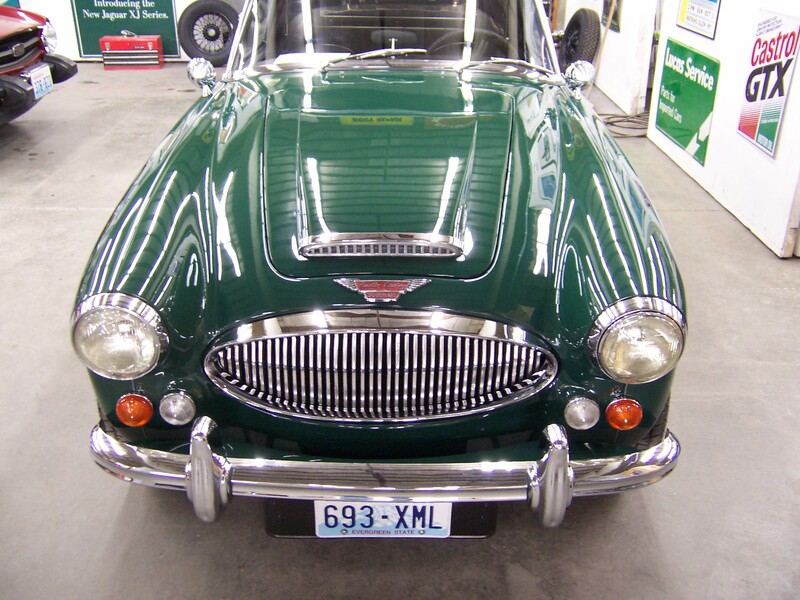 Austin Healey 3000. 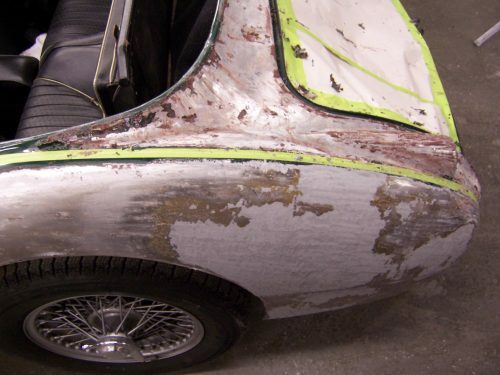 The majority of alloy and steel rust repair complete. Fitting up panels and chrome bits to check gaps. Austin Healey 3000. Fitting exterior panels for gaps. 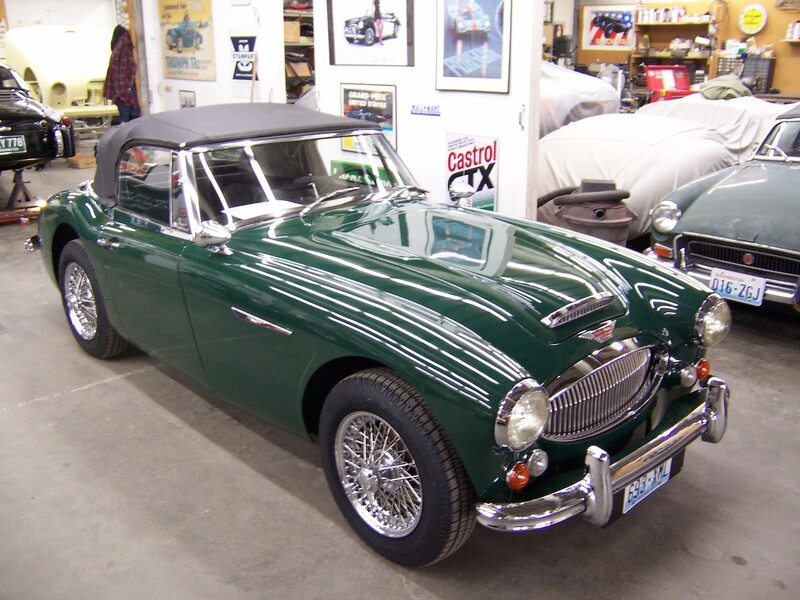 Austin Healey 3000. 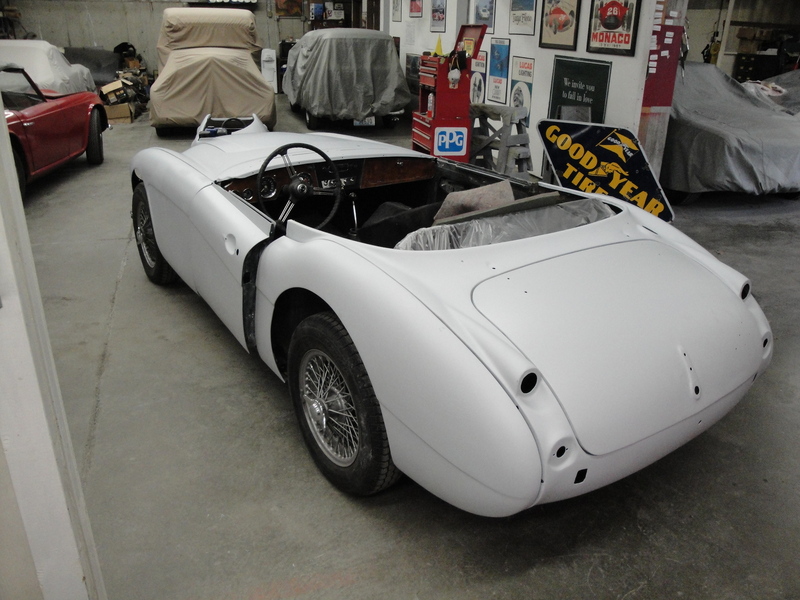 Exterior panels removed for prepping and paint on backsides of shrouds, fenders, doors, etc. 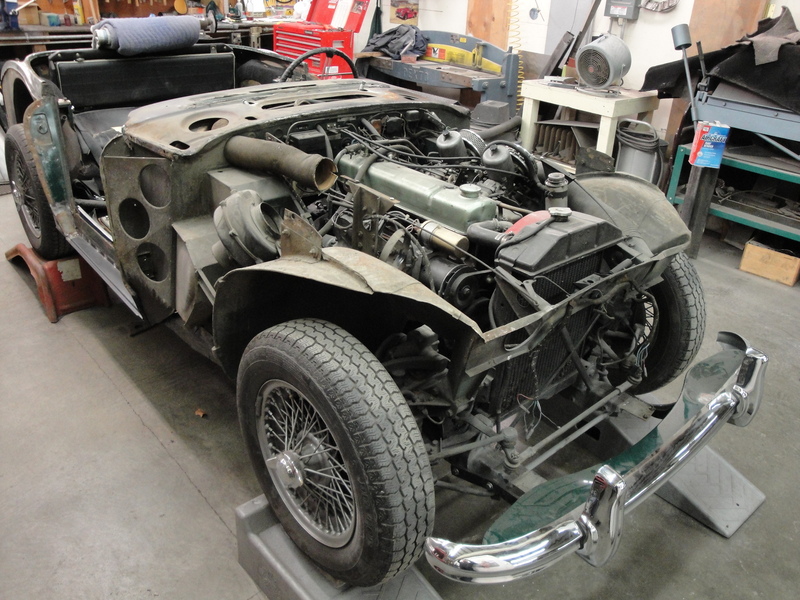 A general clean up of chassis as well. 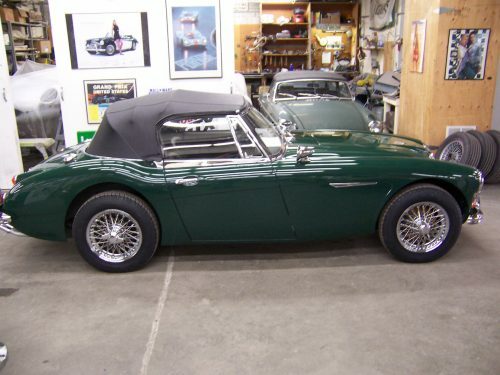 Austin Healey 3000. Front and rear aluminum shrouds scrubbed clean, conversion coating applied, then etch primed with epoxy. Ready for hi-build primer surfacer and flatting. 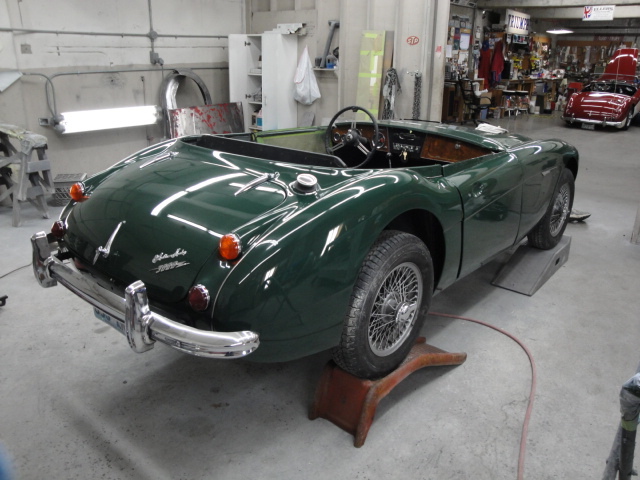 Austin Healey 3000. Hi build primer surfacer applied, guidecoated, and block sanded by hand. Many highs and lows need attention. 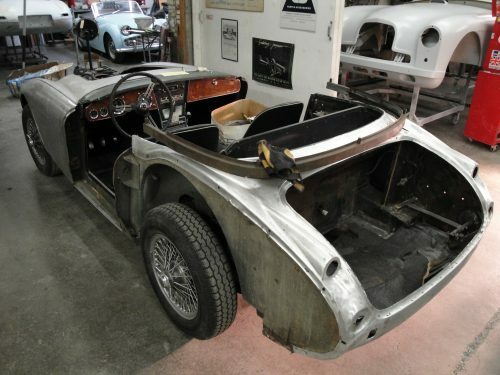 Austin Healey 3000. Many, many labor hours later. 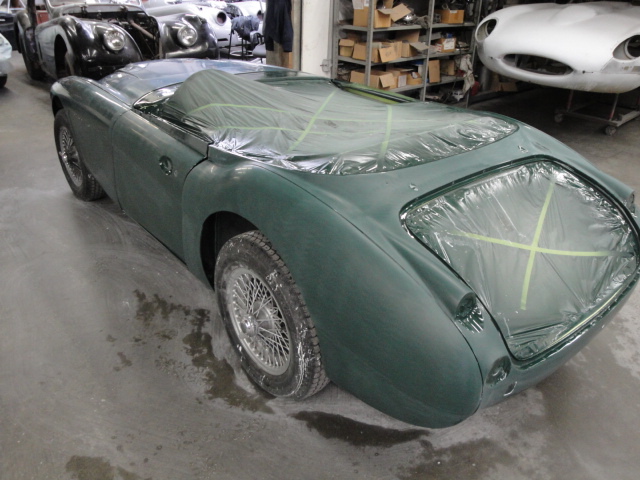 Bodywork completed on all exterior panels and final check of body gaps. 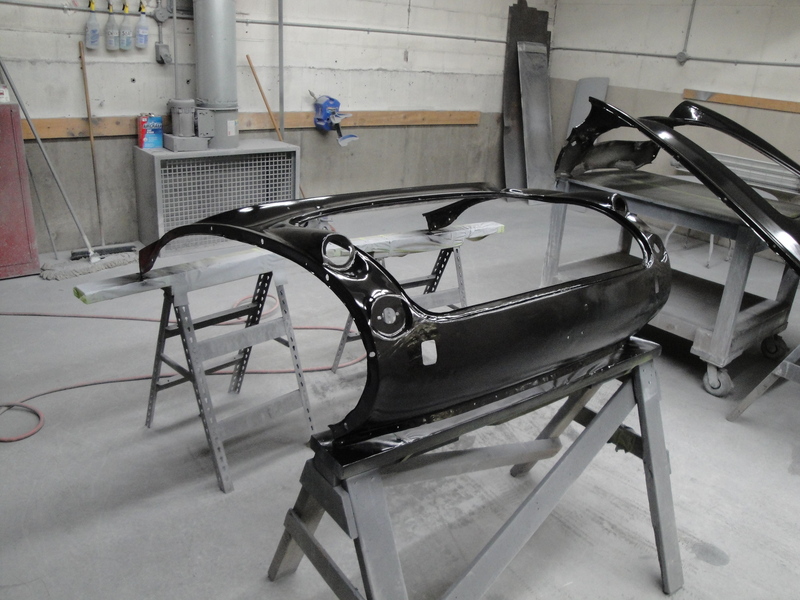 Ready to disassemble and apply color and clear. 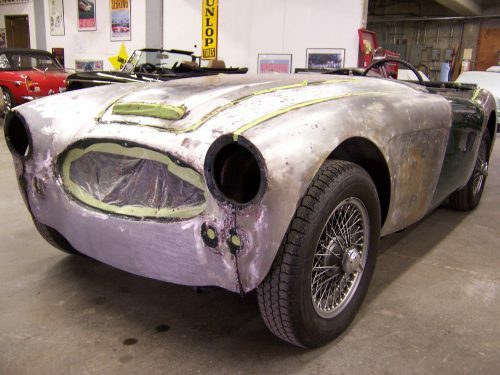 Austin Healey 3000. Bodywork completed. Austin Healey 3000. 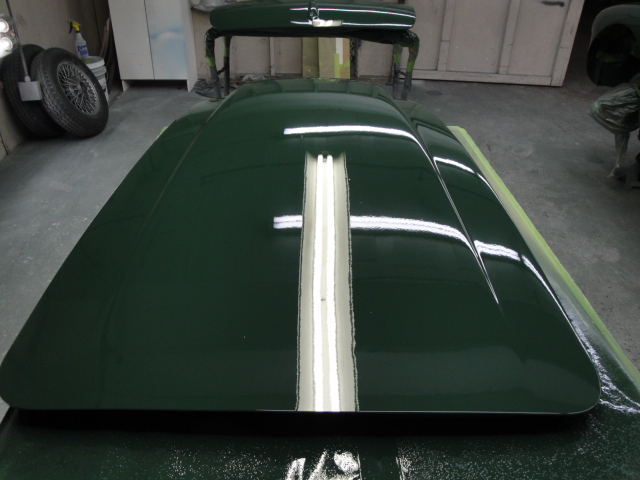 Paintwork completed with application of sealers coats, as well and basecoat/clearcoat applications. Paintwork to cure for a few weeks, then color sanding and post paint rub-out. 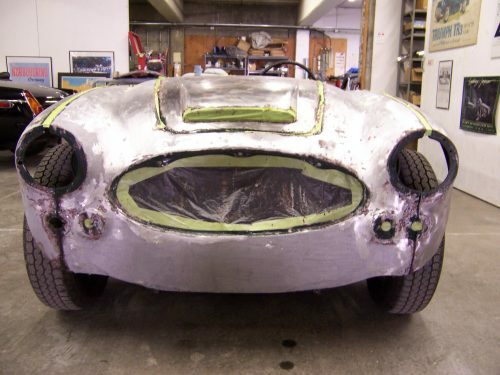 Austin Healey 3000. 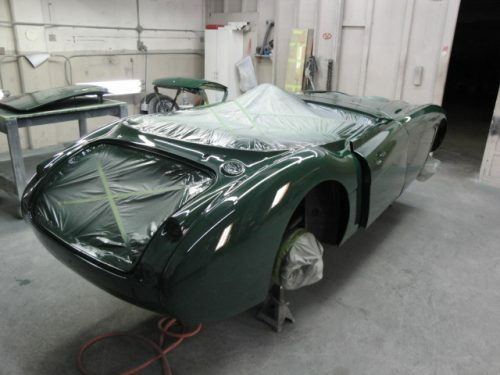 Paintwork completed. Austin Healey 3000. Paintwork completed. I prefer if possible, to spray the bonnet and boot lid detached from main body for color application in order to paint troughs completely. Nothing ruins a decent paint job like unpainted corners. 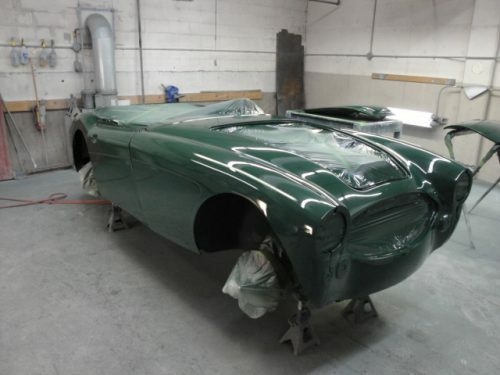 Note exact reflection of overhead lighting in the body and paintwork. 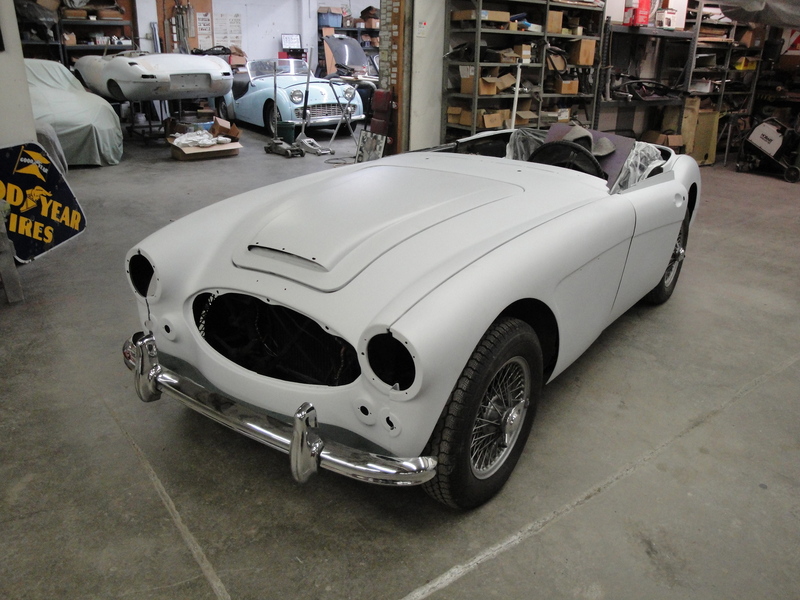 Austin Healey 3000. Color sanding in progress to remove all irregularities and orange peel in paintwork. 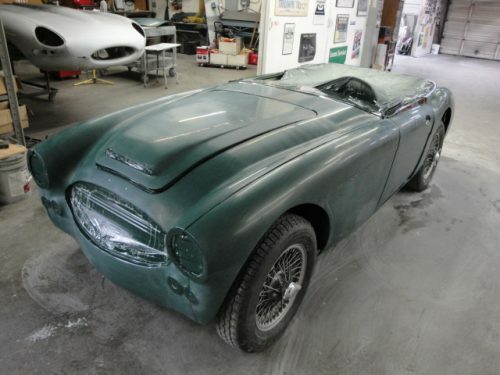 It is at least a two step sanding process by hand, followed with three different polishing steps. 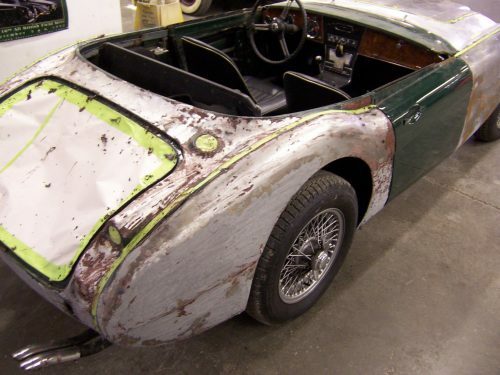 Austin Healey 3000. Color sand in progress. 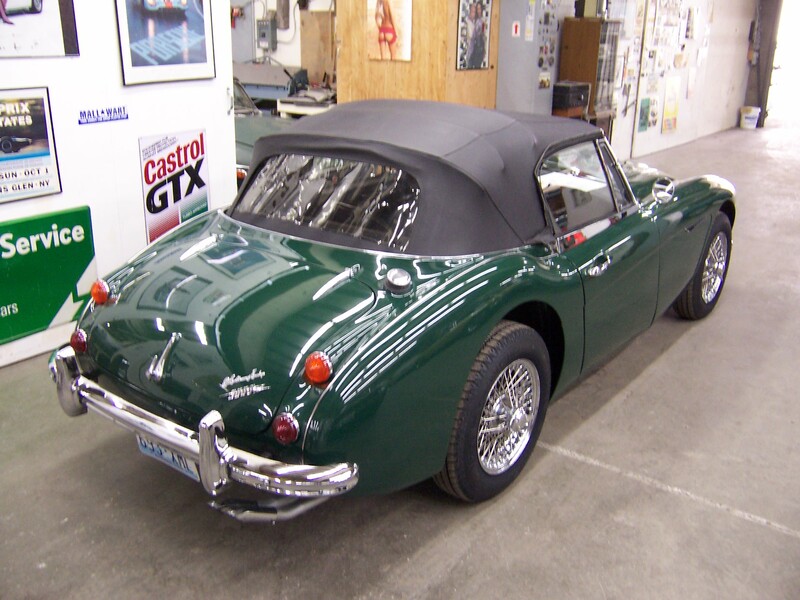 Austin Healey 3000. Color sand complete. 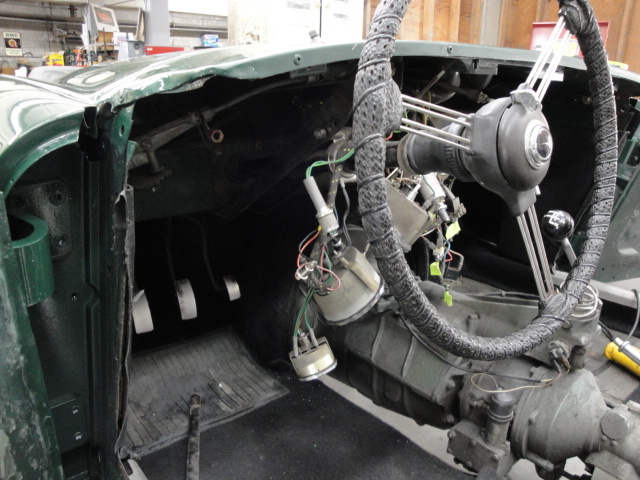 Reassembly of car commences with fitting all exterior panels, trim, fender beading and other brightwork and lights. Most everything needs to be worked or cleaned up before installation with new rubber, gaskets, etc. 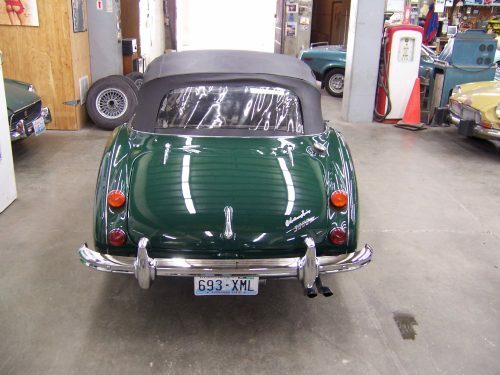 Austin Healey 3000. 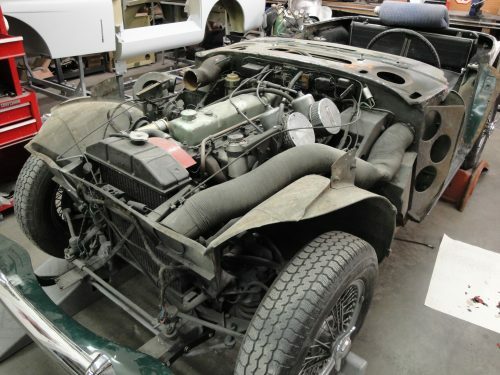 Assembly process. Austin Healey 3000. Requested to do so by the customer, the wooden fascia removed for replacement. 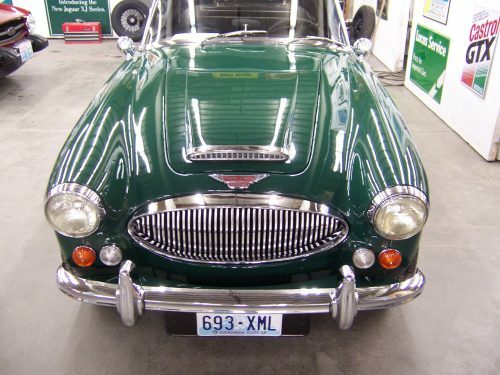 Austin Healey BJ8. Finished and ready for customer pickup. This entry was posted on Sunday, November 15th, 2009 at 5:45 pm	and is filed under Britsport, Past Projects. You can follow any responses to this entry through the RSS 2.0 feed. Both comments and pings are currently closed. It’s a joy to see how the nice job is done ! What’s the vin nr. of this beauty?